Preheat oven to 180°C/360°F. Halve cherry tomatoes and set aside. Wash and dry salmon filet, and place it in a baking dish. Drizzle with some of the olive oil. Season with salt, pepper, garlic powder, and lime zest. Place the salmon filet in the oven and bake at 180°C/360°F for approx. 15 min. Meanwhile, add chickpeas, peas, tahini, parsley, mint, garlic, olive oil, lime juice, salt, and pepper to a food processor. Purée for approx. 30 sec. until creamy. Set the pea hummus aside. Halve the bagels and toast briefly on both sides. Remove the salmon filet from the oven and pull apart with a fork. 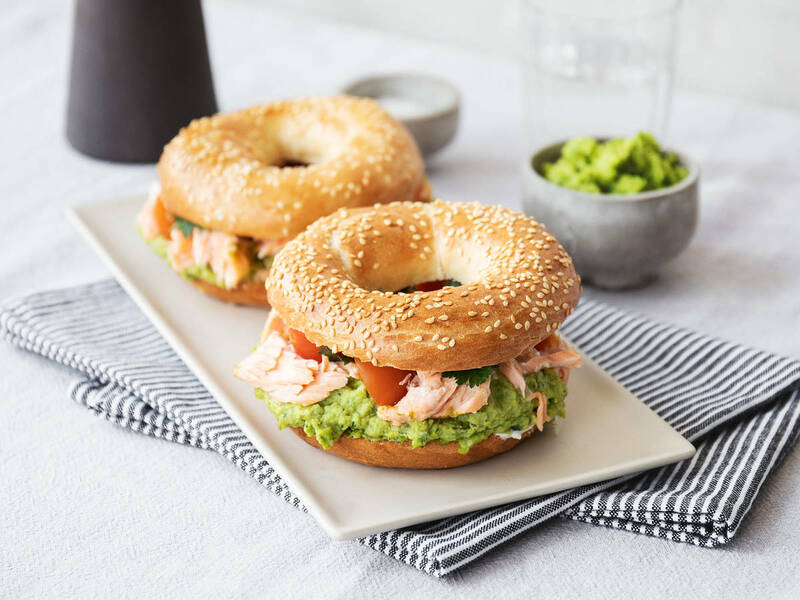 Spread 1 tsp of horseradish and 3 tbsp of pea hummus onto the base of each bagel. Top with a layer of pulled salmon, 3 halves of cherry tomatoes, and some chopped parsley. Cover with the top half of each bagel and enjoy!